Made this tonight during our little music practice session. 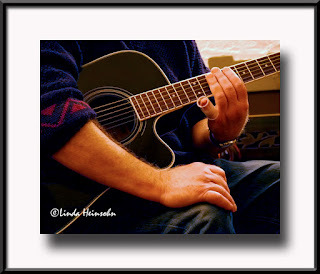 Loved the dark background of John's guitar and his dark sweater and jeans in contrast with his hands and arms. I think the little touch of red in his sweater adds something, too. Not sure what, but I like it. Off to Seattle tomorrow on Amtrak. Hoping the foul weather we're having is limited to rain for the ride both coming and going.